Not that it happens completely in an instant--just like everything else, there's no end. Just constant growth. Still, right now, TODAY, you can get started. You can become a jewelry designer. No matter who you are. Whether your want to be a hobbyist or a professional. You can become a jewelry designer starting now. Imagine having a vision of a piece of jewelry in your mind’s eye and knowing how to bring it to life. Of wearing it and getting compliments on it. Of the satisfaction of holding the final, perfected version in your hands. Honestly, it doesn’t always go like that. Sometimes, I experiment and end up with something outside my vision—and it’s way better than what I had in mind. If you’d like, you can absolutely go to school to become a jewelry designer. In this post though, I talk about how to become a jewelry designer the solo route. Of course, I recommend taking classes, courses, and workshops on types of jewelry you love in order to learn the necessary skills for whatever subcategory you’re interested in. Still, without teachers you can become a jewelry designer. There really aren’t pre-requisites. And whether or not you ever want to sell your designs, designing jewelry gives us the ability to create unique pieces that fit who we are better than anything on the market. Not to mention how the creative outlet is fun, satisfying, and spiritually resonating (speaking from personal experience here). I hope this post can help you unlock your creativity and create things that are unique to you. Don’t be fooled—there aren’t really any rules. There is authenticity and connecting with that is more important than anything. As for the question of who can design jewelry—honestly? Anyone can. 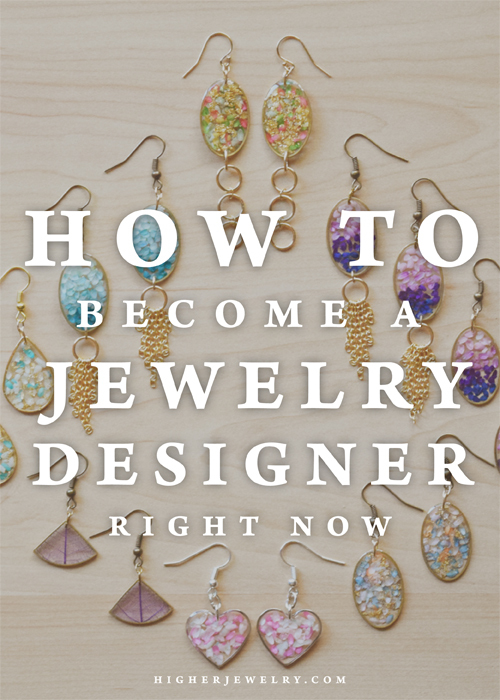 Whether a professional jeweler or a hobbyist—anyone can become a jewelry designer. Of course, design principles and rules are good to understand and know, but they aren’t meant to be strictly adhered to. Jewelry design is an art-form, and therefore it’s a flexible practice that isn’t defined by anything in particular. Some styles are widely liked, and other styles are liked by a small subset of people. But, the most important part of any art is self-expression and communication. It’s the story behind the work, and especially when done for your own sake—it can be powerful and transformational. To realize and make manifest in reality a vision you formed in your mind’s eye. To bring into this work something that is quintessentially you. That's the answer to WHY. Because the humble satisfaction of taking a vision and making it real through a hand-crafted practice is one of the most meditative, powerful, and healing experiences humankind knows. Even when everything is mass-produced in human-free factories people will still choose to work with their hands just for the sake of working with their hands. We will continue hand-crafted traditions forevermore after it’s become outdated because it’s such a human thing to do. In working with our hands, we find a break from the chatter of our minds. A space to heal in. A focus that ignites our hearts and that can stimulate our minds to unravel the knots that have been working themselves into our brainwaves. So . . . why design jewelry? Because it’s fun. Because it’s human. Because the jewelry that is the perfect expression of who you are can only be created by you. Actionable Step 1: create a collage or Pinterest board with images of jewelry that you find beautiful, inspiring, or drawn to. As I said, rules and principles can be broken. But, it’s important to understand them first—that way, when you are designing anything you are able to utilize the principles to help you achieve the end result you desire. The rules and principles speak to how the story of a piece of artwork—whether a painting or piece of jewelry—is told through visuals. Whether the tones communicated are bold, aggressive, joyous, disheartened, serene, abrupt, etc—or a mix of many—the use of size, color, lines, for example, make a huge different in communicating the intending message and style. Going a step further, it's also important to invest time or money--or both--into learning about the specific craft or crafts you would like to get into. Take a look at your collage once it's finished and see what types of jewelry appeal to you. I specifically make botanical resin jewelry. Knowing how to metalwork isn't necessary since the focus of the craft is on embedding plants and other materials into epoxy resin (a clear substance), but it's doesn't hurt either. Personally, I'm not interested in metalwork the same way I'm interested in resin jewelry, so I focus on building the skills that get me making what I'm envisioning. Actionable Step 2: Visit this link to learn about the basics of design principles. Bonus task: learn about Color Theory (not necessary for most of jewelry design unless a lot of color is being used, which resin jewelry can tend to be colorful). Your own style that you find emerging through sketches and compilations of what you’re drawn to may not be generally accepted as beautiful. Either way—it’s no big deal. What you like is what you like. It doesn’t really particularly matter what other people think about it. Let yourself express what you find beautiful through your creative endeavors and give a metaphorical finger to those who criticize without any substance behind their opinions. Over time, your style may evolve. It may go in a direction you never expected. I always encourage to go in these directions, as I went from making bottle necklace jewelry to resin jewelry. I'm happy I grew into a style more suited to who I am today. Today’s action: create a collage or Pinterest board of designs you don’t typically like and examine what you don’t like about them and what you do. Compare and contrast with your initial collage or Pinterest board seeing what’s similar and what’s not. This is just a simple exercise in expanding your understanding of your style—but always remain open to what you don’t initially like. Your style might change or take on parts of a style you don’t like to create something entirely new. You never know. One of the most important factors in designing jewelry pieces that really come from your heart, mind, and soul is to cultivate a sense of adventure and experimentalism. Basically, go out on a limb. Try new things out of curiosity and see where it leads. Sometimes you’ll find that through openness, and even through failure, designs will come out even better than you first imagined. I want to depart this: don’t take the creative process too seriously. Let your creativity flow through you and into this world. Stress does not produce the best work. Being in a state of peace when creating allows you to fully use your subconscious and conscious minds to create quality artwork that is packed full of something distinctly you. Your designs don't have to please everyone. They don't even have to please most people. Your mom could totally hate them (my mom won't say it, but I know there's things I've created that she did not like), doesn't matter. A true jewelry designer has a message. A feeling. A story to tell. There is something in their heart that is demanding to come into reality. There is something in you, right now, that is dying to be expressed. Don't hold it back. Don't lock it up in the back of your mind. For whatever reason, you need to let it out. And you won't believe how amazing it feels. Need to add jewelry-making skills to your repertoire? I invite you to craft beautiful jewelry that you can leave behind on this earth. Jewelry that expresses who you are in a way no other jewelry on earth can, because it’s made with your own two hands in the comfort of your own home. Join me in the Resin Jewelry Making e-course and watch over my shoulder through video lessons from any device, anywhere there’s signal or Wi-Fi (enrollment isn't always open, click to check if it! ).